RICK & MORTY SERIES 1 3D FOAM KEYRINGS! 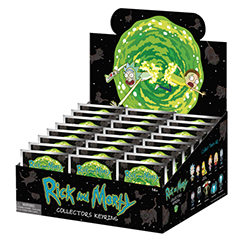 Rick & Morty Series 1 - 3D Foam Collectible Key Rings features characters such as Rick, Morty, Slug from Slippery Step, Kronenberg Summer, Kronenberg Beth, Mech Rick, Mech Morty, Butter Robot, Gromflamite, as well as our two exclusive Fart Gas and Gwendolyn. Pre-order yours today!